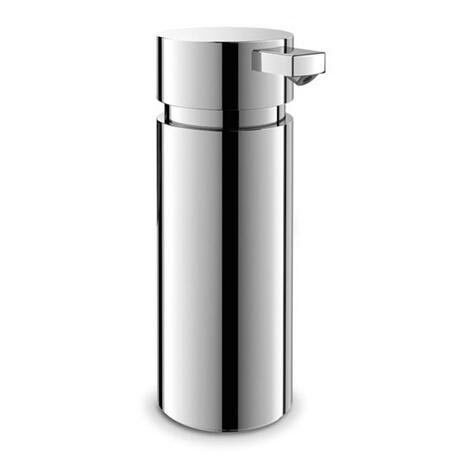 Zack's exclusive designer polished stainless steel freestanding soap dispenser from the Scala collection, simply push the top down to pump soap out of the spout. This contemporary trendy soap dispenser is manufactured from quality 18/10 stainless steel with an outstanding glossy finish. The minimalist soft rounded forms of this sleek gleaming soap dispenser would fit in harmoniously into a wide variety of bathrooms. The stunning wall mounted soap dispenser from Zack gives your bathroom a luxurious and elegant feel. Perfect for people looking to give their bathroom that spa look and keep up to date with recent trends in style. It is made from a durable stainless steel and is finished in a high gloss to complete the contemporary chic. The freestanding element mean you can place it anywhere in the bathroom for your convenience and store it away when not in use. Lovely non-drip pump, minimal design and is looking fab in my new bathroom.